Other Salvatorian Projects in the D.R.C. 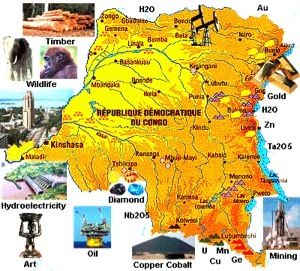 The Democratic Republic of Congo (D.R.C.) has one of the most valuable and diverse concentrations of natural resources in the world, which constitutes a major opportunity for favourable social and economic development. However, most Congolese live in extreme poverty on less than $1 a day, and the D.R.C. is one of the poorest countries in the world. The country is second on the list of fragile states and last in the Human Development Index of the United Nations. Because of armed conflict and dysfunctional institutions and services, its growth prospects are far from its true potential. It is unlikely that the Millennium Development Goals (MDGs) will be achieved by the end of 2015. The poverty rate of the D.R.C. is 70%; two-thirds of the active labour force are unemployed; the literacy rate for the age group 15-24 years is 72%; childbirth mortality is estimated at 670 per 100,000 births; and the prevalence of HIV is 1.3%. In addition, the index of gender inequality was 0.710 in 2011, placing the D.R.C. 142 in a ranking of 146. And sexual violence remains very high. The electrification rate of the D.R.C. is about 11% - only a third of the average for sub-Saharan Africa - a rate which, because of frequent power cuts, is also not stable (Global Status Report 2012 REN21). Rural areas, home to 77% of the 65 million Congolese, have an electrification rate of only 1%. It is therefore not surprising that the vast majority of these 50 million people practice self-sufficiency farming and 94% of them use traditional biomass for cooking (the African average is 65%). Opportunities for electricity generation are enormous but remain virtually untapped. The use of the hydropower potential alone would be sufficient to supply green electricity across the country and even to 3/4 of the African continent. For most rural areas, isolated electricity network solutions powered by small hydro would be the most profitable. That said, the installed capacity of small hydropower does not exceed 65 MW. As we ourselves have experienced, the poor state of transport infrastructure (roads, bridges and railways), the lack of a political/legal/institutional/financial framework for rural electrification, and the bureaucracy do not help the situation. ELKAP ASBL is a non-profit organization established in Kapanga in January 2013. ELKAP, short for ELectricité pour KAPanga, stands for a programme and an ambitious goal: Electricity for Kapanga!